Tish James with the union’s top four officers. From left are: Recording Secretary LaTonya Crisp, Admin. VP Nelson Rivera, President Tony Utano, Tish James, Secretary Treasurer Earl Phillips. 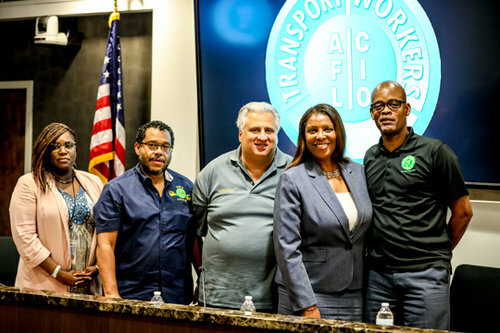 Letitia ‘Tish’ James made a special guest visit to the July Local 100 Executive Board meeting and she was rewarded with a unanimous endorsement for her bid to become the next New York State Attorney General. The Local 100 Executive Board voted unanimously to endorse Tish James for NYS Attorney General.